Good Morning! I am totally loving this week - it's a week of "I'm back" posts. LOL! Well, today's edition is "I'm back with Thursdays with Lindsay." For my monthly card traders group, the challenge was to create a purse card. I was going to post the link where this pattern was found, but when I clicked on the link, the photo had been removed. But I had gone a step further and asked very sweet Penny Duncan to turn this pattern into an SVG file for me so that I can make this task just a bit easier. She was very nice and did. This stunning purse is lined with Lindsay's Stamp Stuff Uptown Houndstooth Cranberry fabric, ahem, paper. The sentiment panel was created with my own sentiment and then decorated with Pretty Border. This card would create a perfect gift card holder. I hope you enjoy this card as much as I do. I think it's lovely and a special thanks to Penny for helping me make this card easier. 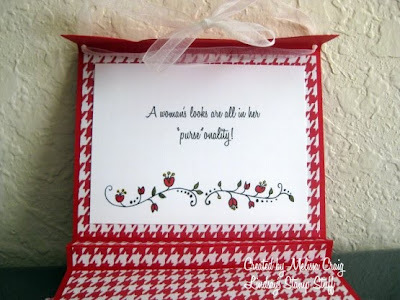 Be sure to stop by Lindsay's blog for this week's freebie and inspiration. And then hop along to the design team's blogs for even more inspiration and eye candy! You're in for a treat as Tracy Vinson joins the team this week. Thanks for stopping by! Oh! One more thing - be sure to stop by Deedee's Digis CDAC group throughout the day. We're having a Luau and you're invited. Wowza! I love the red! The houndstooth looks great! Wonderful job! This is gorgeous Melissa!! I love the red to and the houndstooth looks awesome!! Stunning! I love the red! This is beautiful! I love the houndstooth, so pretty! I'm happy you are back! I love this purse. Very cute! that is really adorable Melissa, welcome back and I love the new profile pic! Miss, this is just so darn amazing! I just love it - love the flowers and the sentiment. Awesome job!! Wish I could figure out my scal thing. Hey, Melissa! Outstanding card! the red houndstooth paper and the purse shape...so cool! By the way, I love the new look of your blog! Oh Melissa...That is GORGEOUS ma'am!!!!! So so so pretty and the houndstooth is awesome!!!! Oh wow Melissa this is stunning I just love the colours and the purse design and what a magnificent flower oooo I love it. Welcome back sweetie!!!!! :-) And I absolutely LOVE love love your card. Lovin' that red, it's just absolutely gorgeous! Sweetie this is drop dead gorgous! I just love everything about it! I am so glad to see that you have your grove back since you moved and have your scrapbooking space. I love your watermark too. Does your friend sell these svg files of this purse? Just wondering! Take care and wishing you a great weekend!Hugs. What a terrific design -- both the pattern and how you used it! This is just stunning, Melissa! I love all the red and white, and that fabulous verse on the inside. Any girl would feel so cherished to get this! 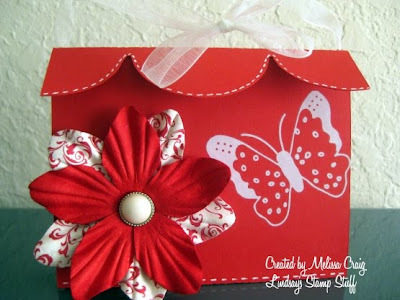 Awesome fold technique and those red DPs are just too fun -- a perfect match for an amazing project!